So I think it has already been established that I cannot keep any type of plant alive. However, I could not deny how cute succulents are (yes, I just referred to a plant as “cute”) so I had to find a work-around. 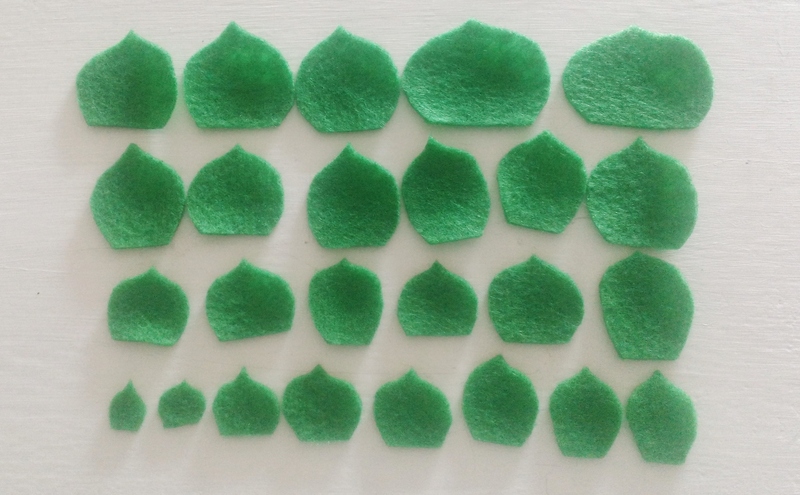 At the same time, I had quite a bit of leftover felt from a previous project, so in my effort to smash my stash, I set out to make succulents out of felt! First thing is selecting colors. I tried to stick to greens and neutrals, but had to work only with the colors I already had in my stash. If I could go out to buy some, I would pick up different shades of grey, light purples, dusty greens, but avoid browns and creams. After looking at a few different tutorials online, I figured the most realistic way (but not the easiest or fastest!) would be to cut out individual ‘petal’ shapes and glue them together going from smallest to largest. Here is an example of the petal shape I was using, and also an idea of the size variation going from small to large. I also experimented with other petal shapes, using both pointy ones ‘>’ and completely rounded ones ‘)’ . I found that this shape ‘}’ ends up looking the most realistic. I stuck to around 25 petals for the large succulents, and about 20 for the small ones. Starting out with the smallest petal, I glued it folded in half, kind of like a taco shape. Then I glued additional petals one at a time, wrapping around the center petal, keeping the glue only at the “base” of the flower, and staggering the petals so they don’t overlap. Once I got a succulent-like shape, I added shading around the edges in a different color using eye shadow. Yes, you read that right. Felt doesn’t take on paint or ink very well, so I used eye shadow to brush on some dusty color on the edges to add depth and color. I tried to stick to neutral shades, and purples, and concentrated the color along the edges and tips of the petals. Warning- these are pretty addictive to make, so plan to put aside enough time! I added in spiky bits, and more “leafy” bits so that there is some variety, and tried to have a good variety of colors and sizes for more realism. I ended up painting the bowl with some leftover paint, for a more modern and clean look for our entry way table. 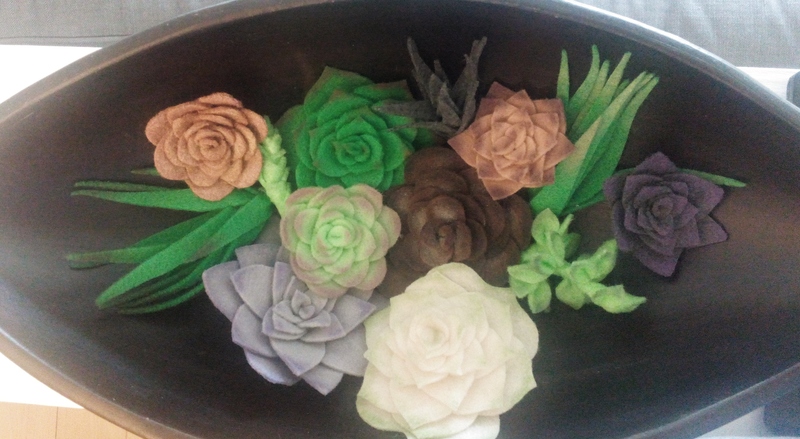 I was originally thinking of gluing down the succulents to the bowl and adding some pebbles around, but I am having too much fun playing around with them and re-arranging them in the bowl, so not now, but might do that at a later time. 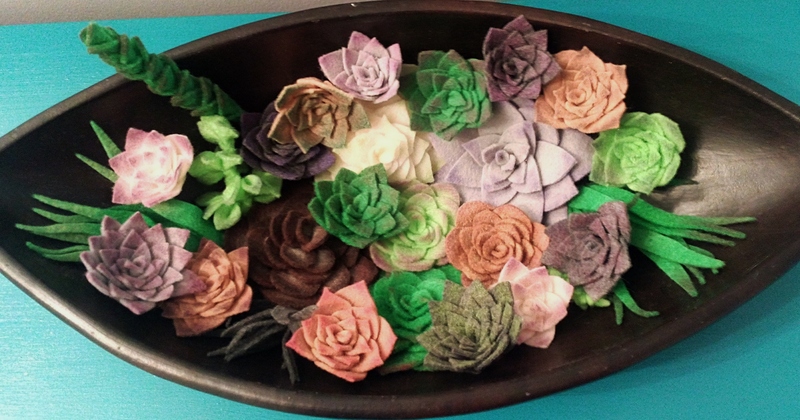 This project is also great with felt scraps, and would definitely work on a smaller scale- picture a single succulent “bloom” in a tiny terracotta pot, or even better, an ornate teacup! I love these. Must be very fiddly to do! I love playing with my glue gun so this sort of thing is right up my street. Thank you! It definitely helps to get that dusty shadowy look around the edges 🙂 Thanks for reading! Oh my gosh!!! These are amazing!!! I’m going to add these to my to-do list for 2016! I too struggle to keep plants alive – even succulents! I feel you, I have even managed to kill a cactus once… or twice! Can’t wait to see how your turn out!